One of the problem of working on the MagPi Magazine (www.themagpi.com) (and now developing hardware “stuff”) is that I need to have my Raspberry Pi with me a lot of the time. The one drawback is my Raspberry Pi gets a rough ride! End result is a broken SD-Card slot and a quick fix is required. My RPi lives in a little case I made from an IC sample box. – RS used to supply sample chips in these and some were being thrown out at work a few days before my 1st RPi arrived. This was back before there were so many cases available, but I’ve grown attached to it now (not least due to the excellent colouring work by one of my girls). Like a lot of the cases on the market now, the SD-Card sticks out and as it bounces around in my bag, a lot of pressure is put on the RPi’s plastic SD-Card slot until one day…it broke. Now I couldn’t have my Raspberry Pi out of action for long. The quick fix, was a modelling clamp, to hold the SD-Card in place and to ensure the detection springs are making contact (otherwise it will fail to boot up). 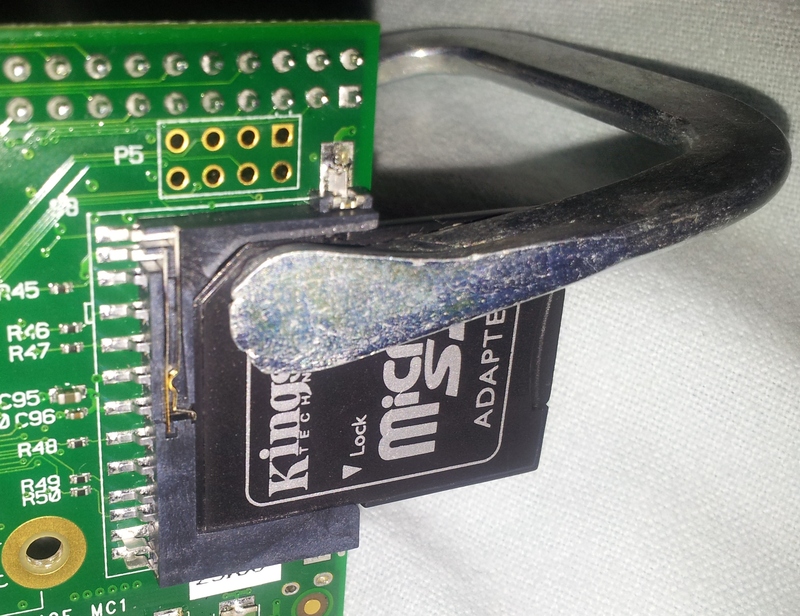 Modelling clamp used as a quick fix for my broken Raspberry Pi SD-Card slot. Fortunately, I always use micro-SD cards, simply because it means I can use them in any SD-card based gadget, micro or full-sized (using adaptors) – This has proved very useful in the past. Usually if you shop well, a micro-SD card and adaptor is about the same price as a full size one so there isn’t much to loose out with (except at the extreme scales of speed and capacity). Therefore, my final solution was to use one of the new Half-size micro-SD card adaptors which have become available, (Adafruit stock these: http://adafruit.com/products/966). Take care not to drop any glue near the metal contacts and near the two “card detection” springs (located at the back and the second one hidden in the right hand side edge). 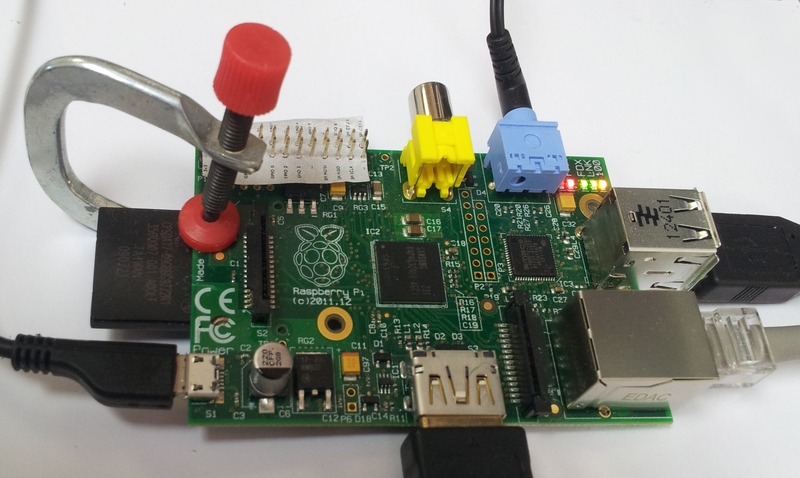 Ensure that you test that the RPi boots when the card is clamped in position, to ensure that is pushed in enough, before you glue it. The micro-adaptor adds a few mm to the bottom of the RPi (around the thickness of a SD-Card in fact) so it will affect the fitting in your case if you have one (for me, just a case of getting the scalpel out and “adjusting” it). While it was too late for my current RPi, the next one I get will use one of these from the start (so I won’t need any glue for that). Also, I imagine the Raspberry Pi foundation will upgrade the SD-Card slot to a metal one at some stage, but not having the card sticking out of the case will prevent the SD-Card from any potential damage too. Yes, that was my 3rd option. However, I decided against it since I would still need to transport my Raspberry Pi, so the same thing would probably happen unless I also found a case which prevented it. 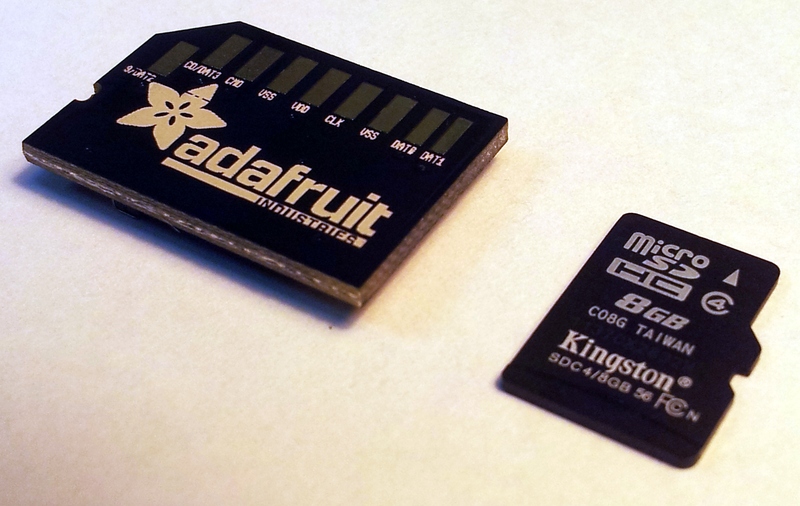 By using the MicroSD adaptor I can ensure the card is safe too. Also when I get a 2nd/3rd RPi, I can use the same type of adaptor and avoid any damage at all. Of course some options will be better than others depending on your situation, the cards you have, the cases you use and your skills/time available.